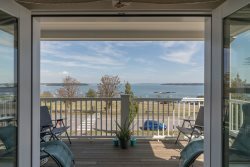 Stunning views of Casco Bay, the Presumpscot River and Estuary. Lovingly built 2 story barn apartment with easy open concept living captures the allure of living in Maine. Attention to detail inside only enhances the gorgeous water views outside. Hardwood floors throughout, beautiful kitchen with bar seating. Half bath on first level. Living room, dining area, and kitchen overlook water from every angle. Master suite on second level offers privacy, beautiful lighting, master bath with tub and separate shower. Washer/dryer on second level. Easy access to water for kayaking & paddle boarding. Bring your own or contact Portland Paddle 207-370-9730 to rent kayaks and paddle boards. Set back from the road offering privacy, lots of green space, patio with beautiful gardens. Private entrance and driveway. Perfectly located between Falmouth and Portland, easy access to i295. Fabulous! The view from the 9 windowed first floor area was worth every penny. Charm was built into this cozy nook. Great sunrises and sunsets. Better furniture than the ones depicted in the listing. Very well maintained and the owner was very responsive to suggestions. Would consider staying again in the future. Wish they had a second bedroom.